What does a sweet little Swiss girl in dirndl have to do with pro football? Quite a bit, as it turned out. A seemingly innocuous decision by an NBC executive-to pre-empt the broadcast of the end of an AFL game for the start of the movie Heidi-triggered a fire storm. Better than any poll, it delivered an unmistakable message about the popularity of pro football and America's passionate attachment to the game. The particulars involved an AFL game between bitter rivals-the New York Jets and Oakland Raiders-at the Oakland Coliseum on November 17, 1968. The game would serve as a lead-in for Heidi, the network's new movie based on the children's book. The game started at 4 p.m. (EST), the movie at 7 p.m. The Jets and Raiders squared off in a classic AFL shootout tinged by hard feelings. Fights, flags, and big hits dominated a first half that ended with Oakland leading 14-12. In the third quarter, Jets safety Jim Hudson became so enraged that he was ejected. The teams traded scores until New York took a 32-29 lead on Jim Turner's 26-yard field goal with 1:05 remaining in the game. The timing could not have been better for NBC. The game went to a commercial, and when the break ended, Heidi started. Network executives had cut away, believing New York's lead was safe with so little time remaining. They were wrong. A 20-yard pass by Daryle Lamonica and a 15-yard penalty put the Raiders into Jets territory. Then, halfback Charlie Smith, isolated on Hudson's replacement, ran by the safety and hauled in a 43-yard touchdown pass with 42 seconds left to put Oakland ahead 36-32. The Raiders were not done, either. 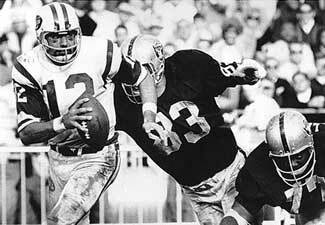 On the ensuing kickoff, the Jets' Earl Christy bobbled the ball, and the Raiders swarmed him at the Jets' 10. The ball squirted to the 2, where the Raiders' Preston Ridlehuber recovered and ran in for a touchdown to conclude a 43-32 victory. The Jets were alternatively shocked and furious, but that was nothing compared to the emotions expressed to the NBC switchboard. So many angry viewers phoned to complain about missing the fantastic ending of a fantastic game that the network issued a public apology.